Carbon monoxide (CO) is a colourless and odourless gas. Because you can't see, taste or smell it, it can affect you or your family before you even know it's there. Even at low levels of exposure, carbon monoxide can cause serious health problems. It is a common byproduct of the burning of fossil fuels. If properly installed and maintained, most fuel-burning equipment produces little CO as the byproducts of combustion are usually safely vented to the outside. However, if anything disrupts the venting process or results in a shortage of oxygen to the burner, CO production can quickly rise to dangerous levels. 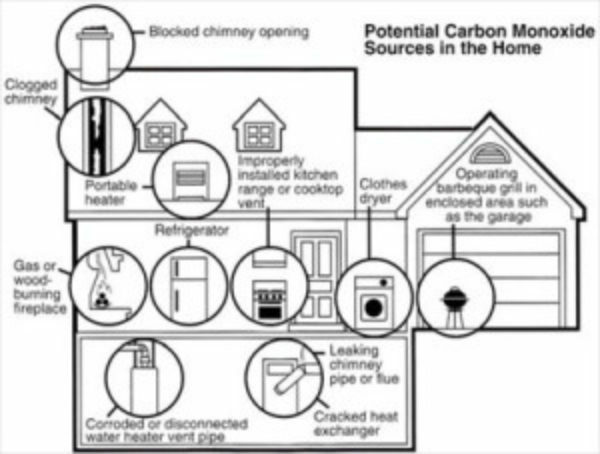 How Can I Eliminate Sources of Carbon Monoxide? The most important step you can take to eliminate the possibility of CO poisoning is to ensure that CO never has an opportunity to enter your building. Have a qualified technician inspect and clean fuel-burning appliances yearly to ensure they are in good working order. Chimneys and vents must be inspected annually for cracks, blockages, corrosion or holes. Never use propane or natural gas stove tops or ovens to heat your building. Never start a vehicle in a closed garage; open the garage doors first. Pull the car out immediately onto the driveway and then close the garage door to prevent exhaust fumes from being drawn into the property. Never run a lawnmower, snowblower or any gasoline-powered tool inside a garage or building. The installation of at least one CO detector in your building is a necessary safety precaution and in some municipalities. It is the law. What Features Should I Look For When Purchasing a Carbon Monoxide Detector? Most CO detectors are designed to give an alarm when CO levels reach a high level in a short time. However, health agencies advise that long-term, low-level exposure is also of concern, especially for the unborn and young children, the elderly and those with a history of heart or respiratory problems. Detectors that can display both high and low levels are more expensive but they do provide greater accuracy and more information. Look for a detector that is listed with the Canadian Standards Association (CSA) standard. Choose a detector with a memory and digital display if you want to monitor long‐term, low‐level exposure and short‐term, high‐level exposure. Battery‐operated units allow detector placement in the most convenient location. However, any battery operated device requires the user’s diligence in replacing worn‐out batteries. Do not connect plug‐in units to an electrical outlet that is controlled by a wall switch. Replace CO detectors every five years, or according to the manufacturer specifications. Sleepiness, but never feeling rested. Rapid heart rate or a tightening of the chest. Chest pain (angina) when exercising. Feeling sick and tired, but fine outside of the building. What Should I Do If My Carbon Monoxide Alarm Goes Off? Do not ignore the CO detector’s alarm if it sounds. Treat each alarm as serious and respond accordingly. CO detectors are designed to sound an alarm before a healthy adult would feel any symptoms. Infants, the elderly and those with respiratory and heart conditions are at particular risk and may react to even low levels of CO poisoning. Evacuate the building, including pets and do a head count. Call 911 if anyone has flu‐like symptoms. Call your gas utility, heating contractor or the fire department to have your property tested immediately. Have a qualified service technician inspect and repair all fuel‐burning appliances if they are identified as being the CO source. Do not re‐occupy the building unless those who tested the property inform you that the danger is over. In general, the best place to put a CO detector is where you will hear it while occupants are sleeping. CO is roughly the same weight as air and distributes evenly throughout a room, so a detector can be placed at any height in any location, as long as its alarm can be heard. Additional units could be installed in several other locations around the building.